It would be a mistake to dismiss Murdoch’s concerns about inequality as nothing more than self-interest. It’s a victory for advocates of regulated markets. 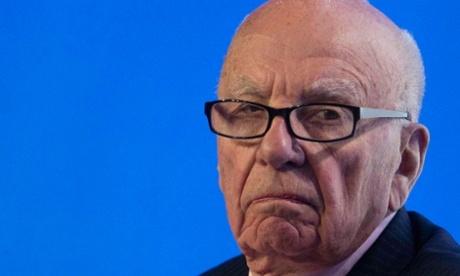 Rupert Murdoch has highlighted growing inequality in a post-dinner speech to G20 finance ministers in Washington. Warning that developed countries’ responses to the financial crisis of 2008 have increased the gap between rich and poor, Murdoch says a global reckoning is approaching unless business investment and innovation are freed up. He suggests that to solve growing inequality and stagnating economies governments need to “get out of the way”. We need labour market reform and lower corporate taxes, the media mogul suggested, perhaps unsurprisingly. He added that tax avoidance by companies like Google should be policed more heavily. Never mind that these companies happen to be giving him a headache by disrupting News Corporation’s business model. That said, it would be a giant mistake to dismiss all that Murdoch has to say as nothing more than self-interest, wrapped in a fig leaf of concern for his fellow humans. If you want to understand the Murdochs of this world then read Ayn Rand’s book Atlas Shrugged. She has a quiet cult following among those who run the world, who just want great people to be able to do great things. In Rand’s world, those with talent who are allowed to use it freely, unencumbered by regulation and bureaucracy, will benefit us all. It’s a compelling, if naïve, picture; unregulated markets cannot discriminate between greatness and power. The heroes and heroines of Rand’s books are paragons of integrity – trusting them to use their wealth and power to do great things is a no-brainer. But as John Steinbeck wrote in Cannery Row, in our system as it really exists, “those traits we detest – sharpness, greed, acquisitiveness, meanness, egotism and self-interest – are the traits of success”. Rand’s fictional champions would be stomped all over by ruthless power-seekers and empire-builders in a truly laissez-faire economy. Markets are social constructs. They only operate effectively when there are rules in place and institutions to enforce those rules – typically government institutions. The more government gets out of the way, the more power accrues to money because those with wealth and power have the means to gain greater wealth and power. As Thomas Piketty demonstrated so beautifully, wealth is like a magnet attracting more wealth. Only government intervention, revolution and war interrupts this ratchet of wealth and power accumulating to wealth and power. So if Murdoch’s concern about inequality is genuine, he should examine the evidence regarding inequality and government policy. In the developed world the standout performers, with high standards of living and low levels of inequality, are all in far northern Europe. These countries loosely share a social and economic system called the Nordic model and have very large government sectors. Sweden and Denmark take around 45% of GDP in taxes. At the other end of the scale sits the US, with one of the highest levels of inequality in the OECD alongside very low equality of opportunity. The US has very low levels of tax as a proportion of GDP and consequently a relatively small government sector. While the US is far from a laissez-faire economy, it’s much closer than many others, particularly the Nordic countries. If we appeal to the evidence, rather than to ideology, we find that Murdoch’s primary solution to inequality would very likely exacerbate the problem. It’s standard fare for the proponents of free markets and small governments to use the Eurozone to build a straw man argument about high taxing, high welfare states being a failure. What they never do is bring up the social democracies of northern Europe, because their success undermines the entire small government philosophy. I have no doubt that Murdoch considers himself to be like one of Rand’s heroes. He’s a great businessman and a symbol of success in the system in which he operates. I’m also sure he truly believes that the suggestions he made to the G20 finance ministers would really create a better world. He must, because that belief has underpinned the growth of his business empire. This is why his prescriptions for saving the world align so well with the interests of News Corporation. It’s not that he’s intentionally feathering his own nest, it’s just an illustration of how ideology, including ethics, aligns with action. Nonetheless, that Murdoch feels the need to speak out about inequality does great credit to the work of people like Piketty and Richard Wilkinson and to the efforts of those involved in the Occupy movement, that was responsible for putting inequality and the 1% back in the spotlight. The next step is to force the implementation of policies that will actually reduce inequality, rather than exacerbate it as Murdoch would have us do. This requires understanding how to pull the levers of power – a topic considered distasteful by many progressives, but built into the core of Murdoch’s politics. How else does he come to be lecturing a collection of finance ministers from the world’s richest countries? This entry was posted in Inequality, philosophy of economics, tax economics and tagged John Steinbeck, Nordic model, politics, Rupert Murdoch, tax to GDP ratio, taxation, The Guardian. Bookmark the permalink.